"With over 35 years experience and an ever growing reputation, you could't ask more from your local drainage company." If you need to know where the drains are and where they go to, this is the service you need. New septic tank systems installed. Maintenance and replacement of existing septic systems. New domestic treatment plants. Cleaning both ground and high level gutting. Abacus can clear any debris from your guttering and hard to reach surfaces. 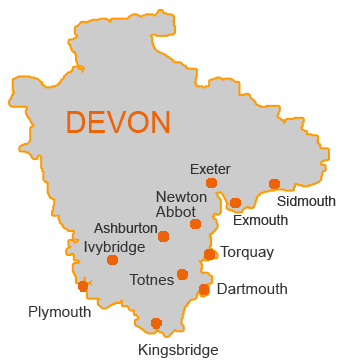 Working in towns such as Dartmouth throughout the region of Devon. Contact Abacus Drainage Services if you find that you have a drainage issue and we will be able to help. Providing you with our CCTV surveying, root removal andhigh pressure/power jetting services. We can also undertake drain mapping and tracing and unblocking drains and sinks. If you find that you have any septic tank issues, we are here to help.. Please see below for information on package sewage treatment plants.